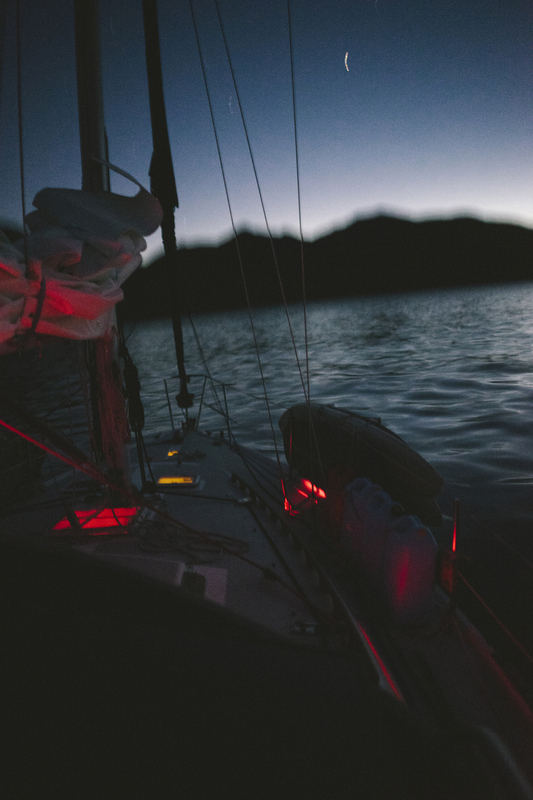 As soon as Trevor Gordon moved onto a sailboat in 2014, we started scheming about sailing to Baja. These loose plans turned into hard dates in the summer of 2015 for a month long trip that fall. In order to take a long trip to a remote area, Trevor and his wife's 36-foot Catalina, the Brisa, needed some upgrades and maintenance. Working throughout the summer, he redid the rigging, ordered new sails, rewired the electronics and spit-shined the engine. Other than a few jaunts out from Santa Barbara to the Channel Islands, I hadn't really spent much time on the boat and I had no real idea what to expect. My only hope was that I didn't get food poisoning. With four guys on a thirty-five foot Catalina, space was limited. I packed a minimal amount of camera gear, Sony A7s II, Sony A7 II, Sony Rx100 IV and two Blackmagic Pocket Cameras, three changes of clothes, some sunglasses and a bunch of downloaded audio books. On October 10th, I flew down from Portland on a one way ticket with the loose plan of being home before Thanksgiving. After a week of prep we set sail headed for Central Baja. From the onset, I planned on making a short film about the trip but had no real idea about structure or story. As the trip developed and the landscape became increasingly more foreign, we jokingly started calling the video Waves on Mars as an ode to the Bowie song. The trip was certainly one of a lifetime. Here is a collection of some of my favorite photos from the trip. Spencer reading anchored at the San Benitos Islands. A fisherman's art in Central Baja. Erin Fienblatt and his dog Kai watching for waves and checking out the Brisa. For a week of the trip, I followed along with Erin filming surf and the Brisa from shore. Making landfall on Isla De Cedros after a 90 mile crossing. Traveling under sail at 5-7 knots, fishing is one of the only ways to keep sanity. It was also our main source of protein on the trip. I was so pumped on the painting for the poster that Adam Burke did, that I decided to do a run of 100 shirts. They're available here on my webstore for $30 shipped in the US. Found these stacked on the beach on an island off the coast of Central Baja. I had just finished reading No Country for Old Men. No we did not take any. PS I was too sketched out to take this photo so Lando did. After a month at sea and just over 1000 nautical miles, we pulled back into customs in the San Diego harbor. I was eager to get back to the treehouses and start editing the video with Jess Gibson. From early on in the trip I knew I wanted to use the Future Islands song Lighthouse in the video, and immediately started trying to get ahold of the band. If you haven't listened to their music before, check them out. The are amazing. I knew I wanted the video to feel like a science fiction film and started working in December with the multitalented Matthew Emmons on tracks. I'm super happy with how it turned out and hope you enjoy it! Waves on Mars?? Limited T-Shirts.